For the Pakistani cricketer, see Ghaffar Khan (cricketer). Abdul Ghaffār Khān (6 February 1890 – 20 January 1988), nicknamed Fakhr-e-Afghan , lit. "pride of Pashtuns"), Bādshāh Khān, or Bāchā Khān, "king of chiefs"), was a Pashtun independence activist who worked to end the rule of the British Raj in India. He was a political and spiritual leader known for his nonviolent opposition; he was a lifelong pacifist and devout Muslim. A close friend of Mohandas Gandhi, Bacha Khan was nicknamed the "Frontier Gandhi" in British India by his close associate Amir Chand Bombwal. Bacha Khan founded the Khudai Khidmatgar ("Servants of God") movement in 1929. Its success triggered a harsh crackdown by the British Raj against him and his supporters, and they suffered some of the most severe repression of the Indian independence movement. Bacha Khan strongly opposed the proposal for the partition of India, siding with the Indian National Congress and All India Azad Muslim Conference. When the Indian National Congress declared its acceptance of the partition plan without consulting the Khudai Khidmatgar leaders, he felt deeply betrayed and hurt by this, telling the Congress, "you have thrown us to the wolves." In June 1947, Khan and other Khudai Khidmatgars declared the Bannu Resolution, demanding that the Pashtuns be given a choice to have an independent state of Pashtunistan, composing all Pashtun territories of British India, instead of being made to join Pakistan. However, the British Raj refused to comply with the demand of this resolution. In response, Bacha Khan and his elder brother Chief Minister Dr Khan Sahib boycotted the referendum on joining Pakistan or India, citing that it did not have the options for the North-West Frontier Province to become independent or join Afghanistan. After the partition, Bacha Khan pledged allegiance to Pakistan, but was frequently arrested by the Pakistani government between 1948 and 1954. In 1956, he was again arrested for his opposition to the One Unit program, under which the government announced its plan to merge all provinces of West Pakistan into a single province. Khan was jailed or in exile during much of the 1960s and 1970s. Upon his death in 1988 in Peshawar under house arrest, following his will, he was buried at his house in Jalalabad, Afghanistan. Tens of thousands of mourners attended his funeral, marching through the Khyber Pass from Peshawar to Jalalabad. It was marred by two bomb explosions that killed 15 people. Despite the heavy fighting at the time during the Soviet–Afghan War, both sides, namely the communist army and the mujahideen, declared a ceasefire to allow Khan's burial. Bacha Khan was born on 6 February 1890 into a generally peaceful and prosperous Pashtun family from Utmanzai in the Peshawar Valley of British India. His father, Bahram Khan, was a land owner in the area commonly referred to as Hashtnaghar. Bacha Khan was the second son of Bahram to attend the British-run Edward's Mission School, the only fully functioning school in the region run by missionaries. At school the young Bacha Khan did well in his studies, and was inspired by his mentor Reverend Wigram to see the importance of education in service to the community. In his 10th and final year of high school, he was offered a highly prestigious commission in the Corps of Guides, a regiment of the British Indian Army. Bacha Khan refused the commission after realising that even Guides officers were still second-class citizens in their own country. He resumed his intention of university study, and Reverend Wigram offered him the opportunity to follow his brother, Khan Abdul Jabbar Khan, to study in London. An alumnus of Aligarh Muslim University, Bacha Khan eventually received the permission of his father. However, Bacha Khan's mother wasn't willing to let another son go to London, so Bacha Khan began working on his father's lands, attempting to discern what more he might do with his life. In 1910, at the age of 20, Khan opened a mosque school in his hometown of Utmanzai. In 1911, he joined independence movement of the Pashtun independence activist Haji Sahib of Turangzai. However, in 1915, the British authorities banned his mosque school. Having witnessed the repeated failure of revolts against the British Raj, Khan decided that social activism and reform would be more beneficial for the Pashtuns. This led to the formation of Anjuman-e Islāh-e Afghānia (انجمن اصلاح افاغنه, "Afghan Reform Society") in 1921, and the youth movement Pax̌tūn Jirga (پښتون جرګه, "Pashtun Assembly") in 1927. After Khan's return from the Hajj pilgrimage to Mecca in May 1928, he founded the Pashto-language monthly political journal Pax̌tūn (پښتون, "Pashtun"). Finally, in November 1929, Khan founded the Khudāyī Khidmatgār (خدايي خدمتګار, "Servants of God") movement, whose success triggered a harsh crackdown by the British authorities against him and his supporters. They suffered some of the most severe repression of the Indian independence movement from the British Raj. In response to his inability to continue his own education, Bacha Khan turned to helping others start theirs. Like many such regions of the world, the strategic importance of the newly formed North-West Frontier Province (now Khyber Pakhtunkhwa, Pakistan) as a buffer for the British Raj from Russian influence was of little benefit to its residents. The oppression of the British, the repression of the mullahs, and an ancient culture of violence and vendetta prompted Bacha Khan to want to serve and uplift his fellow men and women by means of education. At 20 years of age, Bacha Khan opened his first school in Utmanzai. It was an instant success and he was soon invited into a larger circle of progressively minded reformers. Being a secular Muslim he did not believe in religious divisions. He married his first wife Meharqanda in 1912; she was a daughter of Yar Mohammad Khan of the Kinankhel clan of the Mohammadzai tribe of Razzar, a village adjacent to Utmanzai. They had a son in 1913, Abdul Ghani Khan, who would become a noted artist and poet. Subsequently, they had another son, Abdul Wali Khan (17 January 1917 – unknown), and daughter, Sardaro. Meharqanda died during the 1918 influenza epidemic. In 1920, Bacha Khan remarried; his new wife, Nambata, was a cousin of his first wife and the daughter of Sultan Mohammad Khan of Razzar. She bore him a daughter, Mehar Taj (25 May 1921 – 29 April 2012), and a son, Abdul Ali Khan (20 August 1922 – 19 February 1997). Tragically, in 1926 Nambata died early as well from a fall down the stairs of the apartment where they were staying in Jerusalem. In time, Bacha Khan's goal came to be the formulation of a united, independent, secular India. To achieve this end, he founded the Khudai Khidmatgar ("Servants of God"), commonly known as the "Red Shirts" (Surkh Pōsh), during the 1920s. The organisation recruited over 100,000 members and became legendary in opposing (and dying at the hands of) the British-controlled police and army. Through strikes, political organisation and non-violent opposition, the Khudai Khidmatgar were able to achieve some success and came to dominate the politics of Khyber-Pakhtunkhwa. His brother, Dr. Khan Abdul Jabbar Khan (known as Dr. Khan Sahib), led the political wing of the movement, and was the Chief Minister of the province (from 1937 and then until 1947 when his government was dismissed by Mohammad Ali Jinnah of the Muslim League). On 23 April 1930, Bacha Khan was arrested during protests arising out of the Salt Satyagraha. A crowd of Khudai Khidmatgar gathered in Peshawar's Kissa Khwani (Storytellers) Bazaar. The British ordered troops to open fire with machine guns on the unarmed crowd, killing an estimated 200–250. The Khudai Khidmatgar members acted in accord with their training in non-violence under Bacha Khan, facing bullets as the troops fired on them. Two platoons of The Garhwal Rifles regiment under Chandra Singh Garhwali refused to fire on the non-violent crowd. They were later court-martialled with heavy punishment, including life imprisonment. Bacha Khan forged a close, spiritual, and uninhibited friendship with Gandhi, the pioneer of non-violent mass civil disobedience in India. The two had a deep admiration towards each other and worked together closely till 1947. Khudai Khidmatgar (servants of god) agitated and worked cohesively with the Indian National Congress, the leading national organisation fighting for independence, of which Bacha Khan was a senior and respected member. On several occasions when the Congress seemed to disagree with Gandhi on policy, Bacha Khan remained his staunchest ally. In 1931 the Congress offered him the presidency of the party, but he refused saying, "I am a simple soldier and Khudai Khidmatgar, and I only want to serve." He remained a member of the Congress Working Committee for many years, resigning only in 1939 because of his differences with the Party's War Policy. He rejoined the Congress Party when the War Policy was revised. Bacha Khan was a champion of women's rights[dubious – discuss] and nonviolence. He became a hero in a society dominated by violence; notwithstanding his liberal views, his unswerving faith and obvious bravery led to immense respect. Throughout his life, he never lost faith in his non-violent methods or in the compatibility of Islam and nonviolence. He recognised as a jihad struggle with only the enemy holding swords. He was closely identified with Gandhi because of his non-violence principles and he is known in India as the 'Frontier Gandhi'. One of his Congress associates was Pandit Amir Chand Bombwal of Peshawar. O Pathans! Your house has fallen into ruin. Arise and rebuild it, and remember to what race you belong. 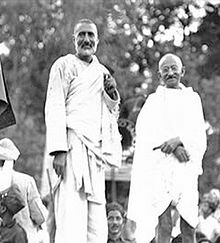 Mahatma Gandhi and Bacha Khan with a leader of the Khaksar Tehrik (founded by Allama Mashriqi). Photo was taken in Peshawar on 6 May 1938. The congress party refused last-ditch compromises to prevent the partition, like the Cabinet Mission plan and Gandhi's suggestion to offer the position of Prime Minister to Jinnah. As a result, Bacha Khan and his followers felt a sense of betrayal by both Pakistan and India. Bacha Khan's last words to Gandhi and his erstwhile allies in the Congress party were: "You have thrown us to the wolves." When the referendum over accession to Pakistan was held, Bacha Khan, the Khudai Khidmatgars, the then Chief Minister Dr Khan Sahib, and the Indian National Congress Party boycotted the referendum. Some have argued that a segment of the population voted was barred from voting. Bacha Khan took the oath of allegiance to the new nation of Pakistan on 23 February 1948 at the first session of the Pakistan Constituent Assembly. Bacha Khan walking with Jawaharlal Nehru after the Cabinet Mission, 1946. He pledged full support to the government and attempted to reconcile with the founder of the new state Muhammad Ali Jinnah. Initial overtures led to a successful meeting in Karachi, however a follow-up meeting in the Khudai Khidmatgar headquarters never materialised, allegedly due to the role of Khyber-Pakhtunkhwa Chief Minister, Abdul Qayyum Khan Kashmiri who warned Jinnah that Bacha Khan was plotting his assassination. Following this, Bacha Khan formed Pakistan's first National opposition party, on 8 May 1948, the Pakistan Azad Party. The party pledged to play the role of constructive opposition and would be non-communal in its philosophy. However, suspicions of his allegiance persisted and under the new Pakistani government, Bacha Khan was placed under house arrest without charge from 1948 till 1954. Released from prison, he gave a speech again on the floor of the constituent assembly, this time condemning the massacre of his supporters at Babrra. I had to go to prison many a time in the days of the Britishers. Although we were at loggerheads with them, yet their treatment was to some extent tolerant and polite. But the treatment which was meted out to me in this Islamic state of ours was such that I would not even like to mention it to you. In 1962, Bacha Khan was named an "Amnesty International Prisoner of the Year". Amnesty's statement about him said, "His example symbolizes the suffering of upward of a million people all over the world who are prisoners of conscience." In September 1964, the Pakistani authorities allowed him to go to United Kingdom for treatment. During the winter, his doctor advised him to go to United States. He then went into exile to Afghanistan, he returned from exile in December 1972 to popular support, following the establishment of a National Awami Party provincial government in North West Frontier Province and Balochistan. He was arrested by Prime Minister Zulfiqar Ali Bhutto's government at Multan in November 1973 and described Bhuttos government as "the worst kind of dictatorship". In 1984, increasingly withdrawing from politics he was nominated for the Nobel Peace Prize. He visited India and participated in the centennial celebrations of the Indian National Congress in 1985; he was awarded the Jawaharlal Nehru Award for International Understanding in 1967 and later Bharat Ratna, India's highest civilian award, in 1987. His final major political challenge was against the Kalabagh dam project, fearing that the project would damage the Peshawar valley, his hostility to it would eventually lead to the project being shelved after his death. Bacha Khan died in Peshawar under house arrest in 1988 and was buried in his house at Jalalabad, Afghanistan. Over 200,000 mourners attended his funeral, including the Afghan president Mohammad Najibullah. This was a symbolic move by Bacha Khan, as this would allow his dream of Pashtun unification to live even after his death. Then Indian Prime Minister Rajiv Gandhi went to Peshawar, to pay his tributes to Bacha Khan despite the fact that General Zia ul-Haq attempted to stall his attendance citing security reasons. Additionally, the Indian government declared a five-day period of mourning in his honour. Although he had been repeatedly imprisoned and persecuted, tens of thousands of mourners attended his funeral, described by one commentator as a caravan of peace, carrying a message of love from Pashtuns east of the Khyber to those on the west, marching through the historic Khyber Pass from Peshawar to Jalalabad. A cease-fire was announced in the Afghan Civil War to allow the funeral to take place, even though it was marred by bomb explosions killing 15. In an interview with an Indian journalist, Haroon Siddiqui, Abdul Ghaffar Khan claimed that the "idea of Pashtunistan never helped Pashtuns. In fact it was never a reality". He further claimed that "successive Afghan governments have exploited the idea for their own political ends". It was only towards the end of Mohammed Daoud Khan regime that he stopped talking about Pashtunistan. Later on, even Nur Muhammad Taraki also talked about the idea of Pashtunistan and caused trouble for Pakistan. He said that "Pashtun people greatly suffered because of all this". Khan Abdul Ghaffar Khan gave this interview while he was in Jalalabad, Afghanistan. His eldest son Ghani Khan was a poet, his other son Khan Abdul Wali Khan is the founder and leader of the Awami National Party and was the Leader of the Opposition in the Pakistan National Assembly. His third son Khan Abdul Ali Khan was non-political and a distinguished educator, and served as Vice-Chancellor of University of Peshawar. Ali Khan was also the head of Aitchison College, Lahore and Fazle Haq college, Mardan. Mohammed Yahya Education Minister of Khyber Pukhtunkhwa, was the only son in law of Bacha Khan. Asfandyar Wali Khan is the grandson of Khan Abdul Gaffar Khan, and leader of the Awami National Party. The party was in power from 2008 to 2013. Yasmin Nigar Khan, the great-granddaughter of Khan Abdul Ghaffar Khan, is the chair of the All India Pakhtoon Jirga-e-Hind. Salma Ataullahjan is the great grand niece of Khan Abdul Gaffar Khan and a member of the Senate of Canada. Bacha Khan's political legacy is renowned amongst Pashtuns and those in modern Republic of India as a leader of a non-violent movement. Within Pakistan, however, the vast majority of society have questioned his stance with the All India Congress over the Muslim League as well as his opposition to Jinnah. In particular, people have questioned where Bacha Khan's patriotism rests following his insistence that he be buried in Afghanistan after his death and not Pakistan. In 1990, a 30 Minutes Biographical Documentary film On Badshah Khan The Majestic Man in English Language Which was telecast On Doordarshan (National channel ) Produced by Mr. Abdul Kabeer Siddiqui, Producer/Director from New Delhi who works for Indian National TV Channel. In Richard Attenborough's 1982 epic Gandhi, Bacha Khan was portrayed by Dilsher Singh. Bacha Khan was listed as one of 26 men who changed the world in a recent children's book published in the United States. He also wrote an autobiography (1969), and has been the subject of biographies by Eknath Easwaran (see article) and Rajmohan Gandhi (see "References" section, below). His philosophy of Islamic pacificism was recognised by US Secretary of State Hillary Clinton, in a speech to American Muslims. In the Indian city of Delhi, the popular Khan Market is named in his honour and another market in the Qarol Bagh of New Delhi is named after him called Ghaffar Market. ^ a b Zartman, I. William (2007). Peacemaking in International Conflict: Methods & Techniques. US Institute of Peace Press. p. 284. ISBN 1929223668. Retrieved 4 February 2013. ^ a b c "Abdul Ghaffar Khan". Encyclopædia Britannica. Retrieved 24 September 2008. ^ a b c d "Abdul Ghaffar Khan". I Love India. Retrieved 24 September 2008. ^ a b "Partition and Military Succession Documents from the U.S. National Archives". ^ a b Ali Shah, Sayyid Vaqar (1993). Marwat, Fazal-ur-Rahim Khan (ed.). Afghanistan and the Frontier. University of Michigan: Emjay Books International. p. 256. ^ a b H Johnson, Thomas; Zellen, Barry (2014). Culture, Conflict, and Counterinsurgency. Stanford University Press. p. 154. ISBN 9780804789219. ^ a b The Peacemaker of the Pashtun Past By KARL E. MEYER The New York Times. 7 December 2001. ^ "Khan Abdul Ghaffar Khan" (PDF). Baacha Khan Trust. Retrieved 4 February 2013. ^ "Retrieved 20 May 2013". ^ "The Sunday Tribune - Spectrum - Article". www.tribuneindia.com. ^ Eknath Easwaran, Nonviolent Soldier of Islam: Badshah Khan: A Man to Match His Mountains (Nilgiri Press, 1984, 1999), p. 25. ^ Abdul Ghaffar Khan, 98, a Follower of Gandhi Published: 21 January 1988. New York Times. ^ "LOVE" (PDF). Retrieved 10 July 2013. ^ a b M.S. Korejo (1993) The Frontier Gandhi, his place in history. Karachi : Oxford University Press. ^ Azad, Abul Kalam (2005) [First published 1959]. India Wins Freedom: An Autobiographical Narrative. New Delhi: Orient Longman. pp. 213–214. ISBN 81-250-0514-5. Khan Abdul Ghaffar Khan had several interviews with him at Karachi and at one stage it seemed that an understanding would be reached ... [Jinnah] planned to go to Peshawar to meet him ... This however did not materialise. Soon the political enemies of the Khan brothers poisoned Jinnah's mind against them. Khan Abdul Qayyum Khan ... was naturally opposed to any reconciliation between Jinnah and the Khan brothers. He therefore behaved in a way which made any understanding impossible. ^ Syed Minhajul Hassan,(1998) Babra Firing Incident: 12 August 1948, Peshawar: University of Peshawar. ^ Badshah Khan, Budget session of Assembly on March 20, 1954. ^ PAKISTAN: The Frontier Gandhi (18 January 1954) Time Magazine. Publisher: Time Inc.
^ "List of the recipients of the Jawaharlal Nehru Award". ICCR website. Archived from the original on 23 March 2013. Retrieved 13 November 2010. ^ a b "Everything in Afghanistan is done in the name of religion: Khan Abdul Ghaffar Khan". India Today. Retrieved 13 January 2014. ^ "Bacha Khan's great-granddaughter says Pakistan was behind attack on university". The Khaama Press News Agency. 23 January 2016. ^ Ali, Arshad (15 February 2018). "Khan Abdul Gaffar Khan's great granddaughter seeks citizenship for 'Phastoons' in India". Daily News and Analysis. Retrieved 21 February 2019. ^ Muslim Media Network. (17 September 2009). Hillary Clinton hosts Iftar at State Department. Archived 2 May 2014 at the Wayback Machine last accessed 22 March 2010. ^ "Khan Abdul Ghaffar Khan Market". Paprika Media Private Ltd. Archived from the original on 16 July 2011. Retrieved 14 November 2008. ^ "My visits to Khan Market". Sify News. Retrieved 14 November 2008. Habib, Irfan (September – October 1997). "Civil Disobedience 1930–31". Social Scientist. Social Scientist. 25 (9–10): 43. doi:10.2307/3517680. JSTOR 3517680. Johansen, Robert C. (1997). "Radical Islam and Nonviolence: A Case Study of Religious Empowerment and Constraint Among Pashtuns". Journal of Peace Research. 34 (1): 53–71. doi:10.1177/0022343397034001005. Tah Da Qam Da Zrah Da Raza, Abdul Ghaffar Khan, Mardan [Khyber-Pakhtunkhwa] Ulasi Adabi Tolanah, 1990. This page was last edited on 22 April 2019, at 03:47 (UTC).